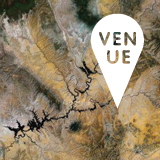 A tip passed along from BLDGBLOG’s meeting with documentary filmmakers tracing lost rivers in cities all over the world led me to the Tyburn Angling Society, and its curious confluence of daylighting, urban foraging, and legislative archaeology. 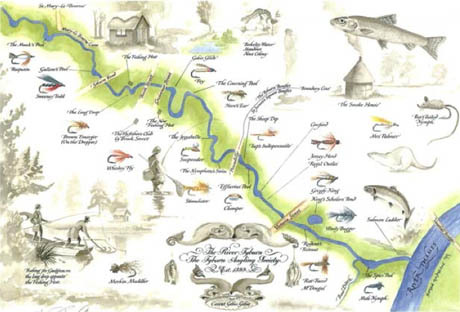 IMAGE: The crest of the Tyburn Angling Society, from Jim Bowdidge’s pecha kucha presentation, available here as a pdf. The story begins in 959, when King Edgar the Peaceable, whose reign was otherwise noted for stability, monastic reforms, and sexual appetite, issued a royal charter listing the privileges and imposts of Westminster. According to property developer Jim Bowdidge, that document also founded the Tyburn Angling Society, by royal decree. 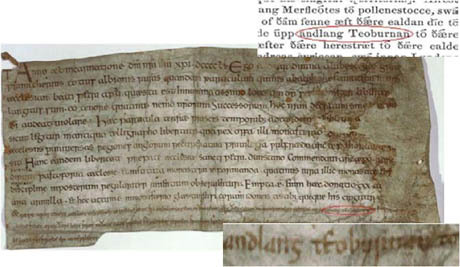 IMAGE: King Edgar’s decree establishing the Tyburn Angling Society; details show the all-important Anglo-Saxon words “andlang teoburnan.” From Jim Bowdidge’s pecha kucha presentation. Bowdidge is a sport fisherman and epicure — his popular column in Fieldsports Magazine: The Shooting and Fishing Quarterly is called “Jimmer’s Dinners” — and he happened to live in a flat above the Tyburn, which is one of the lost rivers of London, having been fully enclosed and absorbed into the city’s sewer system. IMAGE: The traces of the Tyburn. 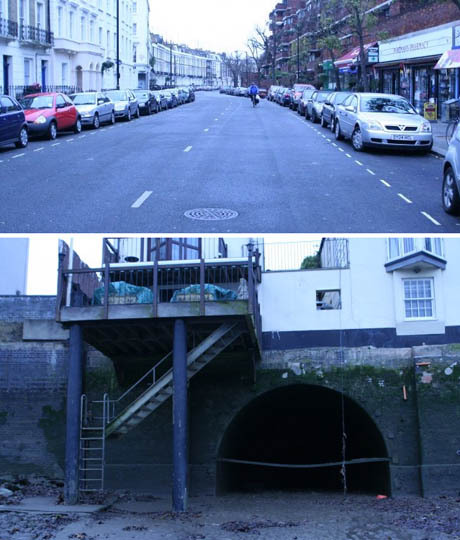 Photos via The Londonist, whose guide to the river provides directions to several grates and manhole covers through which you can listen to the river even today. 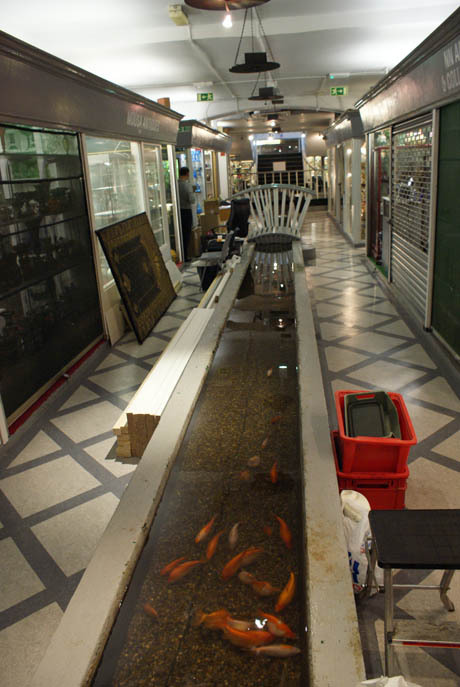 IMAGE: The Tyburn supposedly runs through the basement of Gray’s Antiques. Photo via Wikipedia. “In its heyday,” according to a Property Week investigation, “the Tyburn supported some of London’s best salmon fishing and provided cooking water to the burgeoning financial centre.” Indeed, Wikipedia reports that even today, Gray’s Antiques shop, near Bond Street, claims to have a section of the Tyburn running through its basement, “full of golden fish,” although this seems somewhat unlikely. 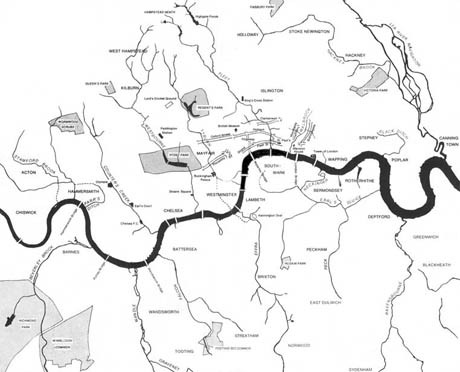 IMAGE: The lost rivers of London, via Strange Maps. IMAGE: Amy Sharrocks leads a walk retracing the course of the Walbrook. Photo by Ruth Corney for the Independent. 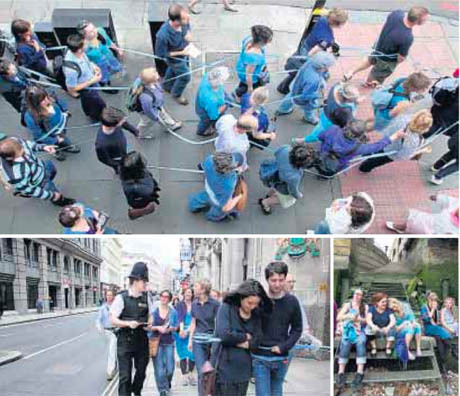 However, retracing and reclaiming the lost rivers of London is a relatively popular activity these days, from artist Amy Sharrocks leading groups of blue-clad people on river walks to the River Restoration Centre’s London River Action Plan, which has Mayor Boris Johnson’s backing. 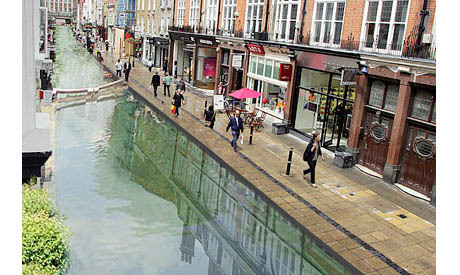 With healthy fish, sea-horses, dolphins, and even a whale being found in the Thames for the first time in a century, if not more, it seems increasingly likely that London’s rivers might one day provide a plentiful protein source for urban fishermen, as well as sport for anglers. 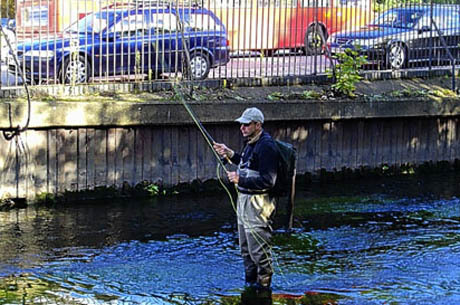 IMAGE: Trout fishing in the Wandle. Photo via the Evening Standard. 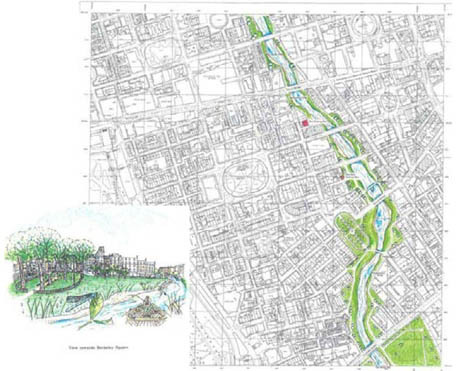 IMAGE: Demolition zone for the Society’s proposed River Tyburn Restoration Project, Phase 1. From Jim Bowdidge’s pecha kucha presentation. IMAGE: Daylighting the Tyburn through South Molton Street. From Jim Bowdidge’s pecha kucha presentation. 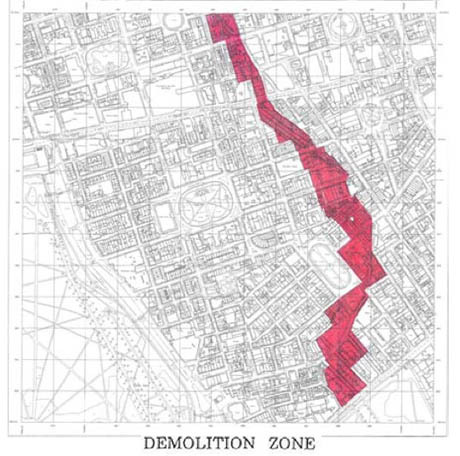 The Society’s architect, David Gaunt, has prepared a detailed map of the proposed demolition zone as well as renderings showing South Molton Street and Berkeley Square as watercourses. 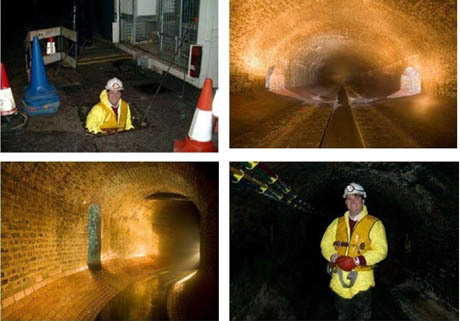 Bowdidge has descended into the sewer itself in order to report on the river’s condition (“Members were concerned by my reports on the poor level of fish stocks and the Honorary Ghillie was taken to task.”). IMAGE: Jim Bowdidge visiting the Tyburn. From Jim Bowdidge’s pecha kucha presentation. IMAGE: The Society has included plans for benches, platforms, and fishing huts in its proposal to daylight the Tyburn. From Jim Bowdidge’s pecha kucha presentation. 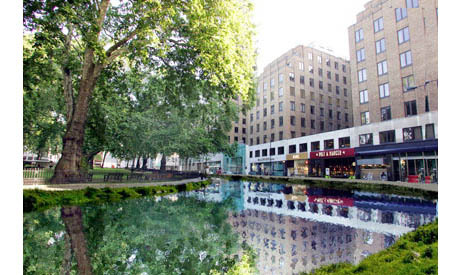 IMAGE: Berkeley Square as re-imagined by the Tyburn Angling Society. Of course, some properties would see their values rise due to waterfront views. From Jim Bowdidge’s pecha kucha presentation. Of course, the scheme is currently little more than a charming celebration of public school eccentricity combined with Photoshop. 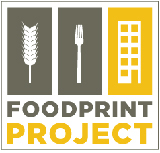 Nonetheless, the idea of digging through London’s medieval statutes to find and redeploy obscure laws in the interest of creating an edible landscape is quite appealing. Act now, before your right to drop citrus peel or drive sheep across London Bridge is repealed by the Statute Law Revision Team! A latecomer to this article, I have just discovered the hidden rivers through Nicci French’s Frieda Klein series. 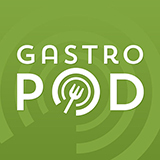 Fascinating topic! A project dealing one of the other twelve underground rivers of London, the Walbrook: a project by two architecture students. Thanks for a great water post! Enjoyed it. Being from the other side of the Atlantic, and only a vistor to your shores once, I was unable to tell if this article was a joke or quite serious. I did, however, enjoy it.